India’s first indigenous nuclear submarine INS Arihant on Monday successfully completed its first deterrence patrol. It also marked the successful completion of India’s nuclear triad — the capability to launch nukes from land, air and sea. INS Arihant will help India complete its nuclear triad. The air and land wing of the triad, with Mirage-2000s and Agni ballistic missile, were already in place. With Arihant successfully completing its deterrence petrol + , India has now completed the triad’s underwater leg. The name Arihant means “annihilator of enemies”. INS Arihant has undergone a host of surface and “dived” sorties during its trials to prove its sea-worthiness. 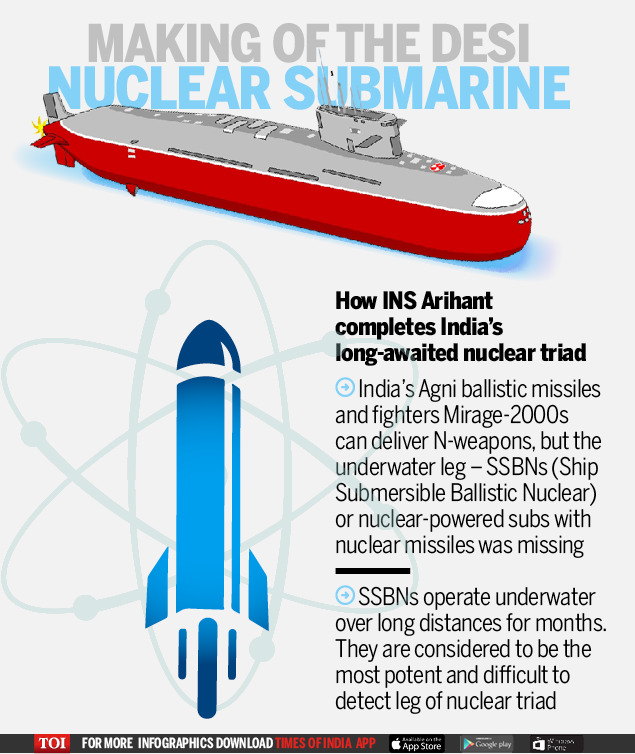 INS Arihant is the first of three such SSBNs constructed under the secretive ATV (advanced technology vessel) programme launched decades ago. The construction of the second one, INS Aridhaman, is also almost complete now, with its delivery slated for 2018. The US, with 70+ nuclear submarines, leads the race with Russia at the second spot with approximately 30 nuclear submarines. At the third sport are the European powers, France and the UK, with 10 to 12 nuclear submarines each. Though the missiles on INS Arihant, with a range of 750km and 3,500km, pale in comparison to missiles on Chinese, the US and Russian submarines, which have ranges of well over 5,000 km, yet the nuclear-triad has been a critical addition to India’s arsenal. The hunt for a nuclear submarine in India began in the 1970s. However, the actual construction of 3 SSBNs began in the 1990s under secret Advanced Technology Vessel (ATV) project. First 6,000-tonne ATV, named INS Arihant, launched into the water at ship-building centre in Visakhapatnam in 2009. On August 10, 2013, Arihant’s 83 MW nuclear reactor got “critical”.